We recommend you read the article Best practices for removing agents, which contains suggestions to avoid some of the common pitfalls in this process. Administrators can promote agents to the administrator role. Select an agent and click Edit. Click the Role drop-down icon and select Administrator. Confirm the change by clicking Yes, upgrade this user in the confirmation window. An email is sent to all administrators notifying them that the person has been added as an administrator. The agent's existing group assignments remain; you can add or remove them from groups as needed. Administrators can downgrade an agent's role to end-user. Click the Admin icon in the sidebar, then select People. On the agent's profile you will see the Role section on the upper left hand side. Select End-user from the drop-down list. After downgrading the agent to an end-user, you can suspend them from the account. This removes them from your Support instance. 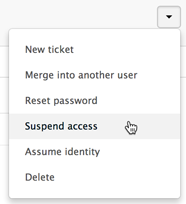 Click the drop-down icon at the top-right of the profile and select Suspend access.